When it comes to reddit, I am a big fan. I have been on the site for almost six years now. What started with a simple effort to get attention to my own sites got me addicted to reddit for all these years and I don't regret it. I am browsing reddit everyday, reading interesting questions and thoughtful answers to them, learning new things and also watching some entertaining pictures. I am a heavy reddit user and I browse it mostly through a computer. Now I have started browsing it from my cell phone as well. I previously used the browser in my phone for reddit and now since I have discovered awesome apps for reddit, I like to use them. One of my favorite apps to use reddit on the phone is called reddit sync. 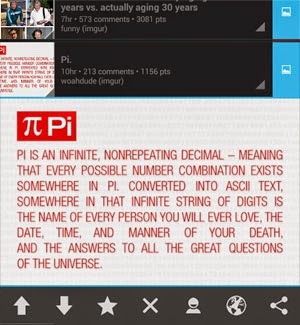 There are heaps of other reddit apps, why this one? Well, if you have only access to internet via WiFi and you do not have an internet plan for your phone, you might not always have access to the internet. While on the go, you normally don't get access unless you are in a public WiFi zone. In such cases, if you want to browse reddit, then you can't. This app called reddit sync, allows you to browse reddit on the go. It syncs with reddit servers once you press a button on your screen. Do that when you have access to the internet and later you can easily browse reddit even if you are not connected to the internet. Just click on the "sync" button from the menu and it will ask you how many pages to sync and whether or not to sync comments and how many of those comments to sync. Once the syncing completes, you will be able to view posts, pictures from imgur and read comments all based on your preferences. 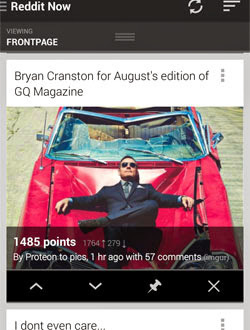 reddit sync is an app that features a magazine like layout for reddit. In the settings you will find options to configure this app. You can configure the theme (Night Mode or not) and there are several other features to save you a whole lot of trouble. You can easily log in to reddit with this app and browse your subreddits. Once you are logged in you can easily comment, upvote, downvote, hide, share, submit and reply to posts. You can also get the URLs to those posts and link, view user profiles and your subscribed subreddits. Your homepage will be provided in a neat layout suitable for your phone. Swiping is supported. You can swipe to move between the different sub-reddits you have subscribed to. There is also a full screen mode to load posts all over your phone screen. So, get reddit sync, the best app to use when you want to browse reddit when offline.